Oranges…their bright coloring is sure to add cheer on a cold winter day. The scent of fresh oranges is uplifting to the senses- and the appetite! Winter time is orange time for us here in California. We may look forward to a bit of sunshine in our kitchen and ways to nourish our bodies with much-needed vitamin C during the cold winter months. The peel of an orange contains more vitamin C than the fruit itself. 100 mg worth of orange peel includes 136 mg of vitamin C, while 100 mg worth of the fruit itself contains 48.5 mg of vitamin C. Considering the actual vitamin content of dried orange peel is debatable, there are still benefits to consuming the peels. Such as being a good source of fiber and offering anti-histamine properties. Orange peels are also high in phytonutrients that include bioflavonoids, which in turn enhance the effects of vitamin C. It is a well-known fact that Vitamin C is a powerful antioxidant. Vitamin C aids in healing, improves immunity, may be beneficial in stabilizing cholesterol levels, may help to lower blood pressure, is protective against pollution, and is essential in the formation of collagen. Vitamin C may also enhance the absorption of dietary iron (non-heme iron). As a water-soluble vitamin, it is not stored in our bodies, and excess amounts are readily excreted, meaning that overdosing is a rare occurrence. Our bodies cannot manufacture vitamin C, so we must obtain it through diet or supplements. Incidentally, our bodies are not made to process synthetic vitamins. Most of the nutrients we require for optimal health can be found in nature. However, there are times when a deficiency is too significant and we are required to take supplements. Whole food supplements are a sensible choice if needed. In some instances, making your whole food supplements isn’t too difficult. 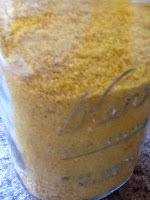 Homemade orange peel powder is a simple, cost-effective process. A fresh peel can be added to smoothies and recipes to reap the full antioxidant benefit of the peel. It can also be dried for long-term storage. Keep in mind that exposure to heat and air will cause vitamin C to degrade. So the actual vitamin content of dried peels will be less than the fresh peels. To begin, make sure the oranges you are using have been grown organically. If you have your own orange tree or know someone who does, then that’s even better! Just be sure to verify that the oranges have been grown with only sunshine and water. (No pesticides, herbicides, or fungicides.) Also, check that the oranges haven’t been coated with wax, as they often are at the grocery store. Thoroughly wash the oranges before cutting them. Keep the white part (pith) on the peels. Spread the peels out as a single layer and keep out of direct sun. A dehydrator can help speed up the drying process. However, heat does kill enzymes. If using a dehydrator, use the lowest possible temperature. Drying time depends on the time of the year and how humid your environment is. 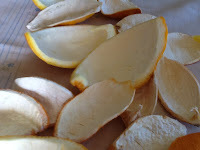 When the peels are thoroughly dried, they will be crunchy. They are then ready to pulverize! I use my Vitamix to powder the peels. 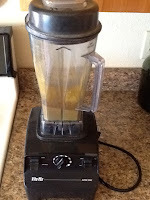 A food processor or coffee grinder can also be used. You may need to break the pieces up a bit before adding them. 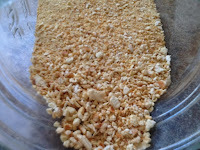 Be sure to add only a few peels at a time and process until they are fully ground into a powder. Of course, you can also break up the peels by hand or even keep them whole, if you are using them for a recipe or in tea. Store in an airtight container in a dry place out of direct sunlight. The powder can be added to smoothies, teas, recipes and can also be encapsulated. 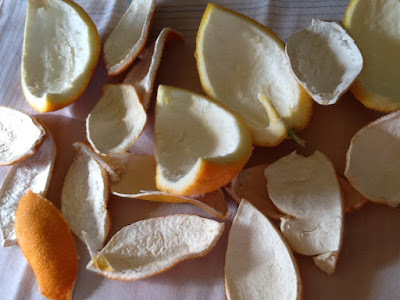 Read here for more ideas on how to use orange or citrus peels. As with any supplement, always consult a qualified health professional before making dietary changes, especially if you are on any medication or are experiencing health issues. Balch, Phyllis A. “Vitamins.” Prescription for Nutritional Healing. New York: Avery, 2006. 23-24. Print.